Here's a question we hear from time to time, "How much is the price of sterling flatware affected by the commodity silver market?" 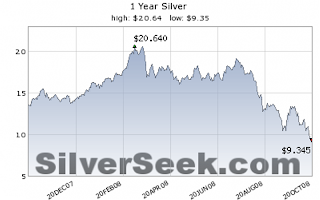 Raw silver dropped in price by over 50% during the period from the March 2008 to October 2008. I know for a fact that the market price of a Buttercup teaspoon or a Chantilly fork did not fall by 50% during the same time period. In my opinion, the price for these pieces stayed roughly the same. So, if you are thinking of buying, or selling, some sterling flatware pieces, my suggestion is not to worry too much about the current price of raw silver. Other economic conditions may have a greater impact. How Do I Sell My Sterling Flatware? When is Tarnish a Positive Thing? Is Used Sterling Flatware a Proper Gift?